On the 4 August 1892 Andrew Borden and his second wife, Abby, were brutally murdered in their home at 92 Second Street in Fall River, Massachusetts and Andrew’s daughter, Lizzie, was charged with the murders. She was tried and was acquitted in June 1893 and speculation about the murders and whether Lizzie was guilty or not continues to the present day. 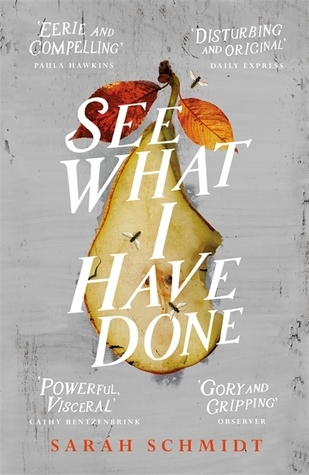 See What I Have Done by Sarah Schmidt is a work of fiction based on true events using various resources. Lizzie was thirty two at the time of the murders but in this fictionalised account she seems emotionally much younger, more like a teenager than a mature woman. The narrative is shared by Lizzie, her sister Emma, Bridget their maid and Benjamin, a ‘friend’ of Lizzie’s Uncle John, and moves backwards and forwards in time, before and after 4 August 1892. Lizzie’s account is the strangest and it takes you right inside her mind. She is a disturbed and unstable character to say the least and I had the most unsettling feeling as I read that I was right inside her crazy, demented mind. 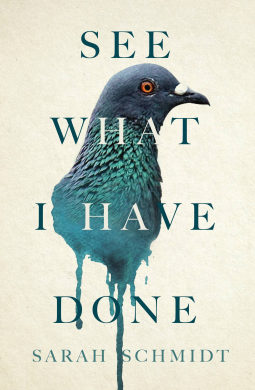 The writing is ambiguous in parts, lending enough credence to cast doubt on Lizzie’s guilt – and then in other parts I was convinced that she had committed the murders. It’s the introduction of Benjamin, a fictional character, a vicious and violent man, that provides an explanation of what happened to the murder weapon, that the police were unable to find. Sarah Schmidt’s prose highlights the senses – the sights, sounds, smells, and tastes are aroused. The tension is palpable, and the fear and feverish atmosphere in the Borden’s house comes to a climax in the gruesome murders. It is indeed eerie and compelling, a mesmerising book. I received this as an ARC from the publisher, the Atlantic Monthly Press, via NetGalley. And it is published in the US on 1 August 2017 in hardback.